When writing the CotM for Auchenoglanis occidentalis nigh on 14 years ago there were only two species in that genus considered valid at that time. I didn't know many more congeners were around the corner, and, more importantly, I didn't know Birger Kamprath either. Nowadays we have Birger onboard as a PlanetCatfish contributor there are few who could better introduce this species and explain the rather long history of the genus Auchenoglanis. The first species of the genus Auchenoglanis was initially introduced as Pimelodus biscutatus in 1808 by Geoffroy St. Hilaire and then the next as Pimelodus occidentalis by Valenciennes in 1840. These two have always kept their specific names and in the history of Auchenoglanis you will also see generic names like Oxyglanis and Auchenaspis. A number of species were moved into and again out of Auchenoglanis with many going to the present day genera Anaspidoglanis and Parauchenoglanis while others were retained in synonymy to the two original species. Recently, a revision by Micheal Retzer (2010) not only revalidated a number of these older synonyms but additionally described a completely new member into the genus which is the focus catfish this month. Named for the Country of origin where the holotype of the species was collected, Auchenoglanis senegali is found in West Africa in drainages of the Senegal River and also of the Gambia River slightly farther south and collected near long time favourites like Brachysynodontis batensoda, Hemisynodontis membranacea, Synodontis clarias and S. ocellifer. 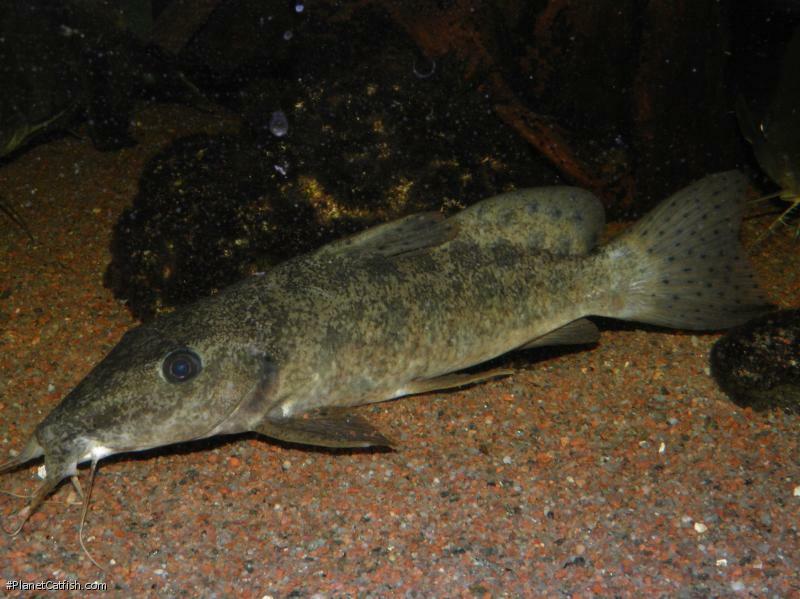 The giraffe catfish, Auchenoglanis occidentalis, is also collected in the region but unfortunately is a species that reaches unmanageable sizes for the home aquarist. That is where Auchenoglanis senegali could be of interest to hobbyists as most have been under the impression that giraffe catfish with their explosive growth and eventual size are for the largest of home aquaria or only for public aquariums. 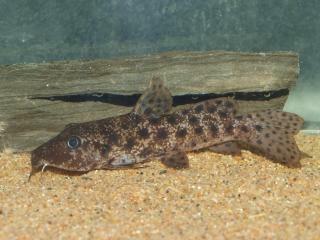 If you have always liked the thought of keeping a giraffe catfish current reports for this particular species are beginning to show that at about 250 mm (9.8 in.) TL there is a big deceleration in growth with minimal later increases making it tentatively possible to be kept in home aquaria long term. The body on this little giraffe cat is lightly mottled grey/brown changing to white near the lowest areas and the bottom lip of the mouth. It is important to note, the two photos here are taken within the hour with the same overhead light, flash, camera and fish which was 110 mm SL (4.33 in.). The color of the substrate will affect whether the fish looks predominately grey or brownish. The contrast of the spot pattern to the body color may also be affected. With age spotting may also fade and the upper body darken. There are three horizontal rows of dark spots comparable to the size of the eye along the main body excluding the head which still retains the mottled appearance. Fins are grey/brown, the adipose having large spots but all the other fins having smaller dark spots with the caudal fin having the smallest spots in an evenly spaced pattern. An important item when looking to identify an Auchenoglanis is the colouration of the barbels, being light grey/brown in A. senegali as opposed to being white, black or dark brown in the other known species. While found in the same area as Auchenoglanis occidentalis when making comparisons A. senegali is more similar to A. biscutatus which is found further east within the Nile Basin, the adipose fin on both are very much alike, the two are the only species where the highest point of the adipose fin is the central point as opposed to being tallest at the very rear of the fin. This is another crucial point when looking to identify an Auchenoglanis but is much more obvious in adults. Care must also be taken when working with or around these fish. The pectoral spines are serrated on the trailing edge and along with the dorsal spine is very strong and sharp being able to tangle in nets and shipping bags. I know from personal experience it draws blood every time I need to handle it. To maintain this fish I expect them to be adaptive to water conditions. The waters this species come from should be slightly warmer 25-34°C with a 6.5-8.0 pH range. Being a size for some to attempt reproduction one would have to do more research on the waters it is collected in and whether or not it is a migratory catfish. I personally look to information from Killi keepers and the book Cichlid Fishes of Western Africa (written by Anton Lamboj) for guidance when it comes to water parameters in these areas. A varied diet of bloodworm, mysis, a good pellet food and some veggies are offered to my own fish. Feeding is simple as they eat most anything offered. Sifting through the substrate in their search for food a sand bottom would be preferred for just this reason and I always find it interesting to watch. Not being the large size of most other Auchenoglanis species I would still consider this a larger fish for the home aquarium and tank mates have to be chosen accordingly, these are actually a peaceful fish and like to search the substrate so that means no cichlids or other catfish that will attack a fish that roams into their territory. What is needed though are fish that will not be intimidated by its size when this catfish is on the hunt for food and can get their fair share. Examples of fish that I think would be good tank mates for an always hungry giraffe are medium sized African barbs, Phenacogrammus species or mildly to non-aggressive species of Synodontis. There is a number of distinct variants of Auchenoglanis from other drainages that may prove interesting to ichthyologists seeking to fully understand the biodiversity of the genus. Some may become new species, might have smaller adult sizes and could also be of interest to the home aquarist. In the mean time we have this great little spotted giraffe cat that is every bit a character as its larger cousins. Type Locality Saint-Louis, Forom River, Camp Djoudj, 16°22'N, 16°16'W, Senegal. Etymology Auchenoglanis: From the Greek, auchenos, meaning neck and glanis, meaning catfish; in reference to the long cranial shield. Named for the country of origin where the type locality is located. Size 203mm or 8" SL. Find near, nearer or same sized spp. Identification The genus is diagnosed on the basis of a unique combination of characters: a deep and broad skull, narrow mouth, reduced pramaxillary tooth patches, anterior nostrils on the upper lip, and three large nuchal plates, the first which is in close proximity to the rear of the supraoccipital- a bone on the dorsal side of the great foramen(opening) of the skull. The adult body is white to light brown on the sides of the body, the ventral portion is white. Occasionally the upper one half of the body is slightly darker than the lower half. Large specimens have three horizontal series of dark spots on the body and intense dark spots on the fins although spots may be less intense and more diffuse on some specimens and wider spaced than in A. biscutatus. 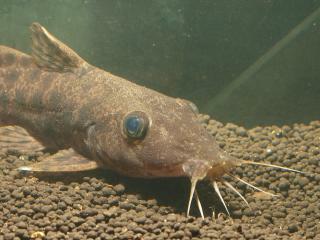 The barbels are light grey or brown although the mandibular barbels may be less dark than the maxillary barbels. the sides and top of the head are brown and without spots. The lower side of the head is white including the lower lip. The anterior edge of the adipose fin rises steeply and reaches its maximum height at a point approximately one half the length of the adipose fin. General Remarks There is a good chance the size potential of the different species of Auchenoglanis may be much bigger than what is shown on the data pages. Some of the current data comes from studies which do not always use fully grown adult fish, sizes will be adjusted as proof of larger adult sizes are revealed. Most species will be larger, A. senegali being the only one proven to stay smaller so far. Distribution Known only from the Senegal and Gambia river basins of West Africa. References Retzer, ME, 2010. Taxonomy of Auchenoglanis Günther 1865 (Siluriformes: Auchenoglanididae). Zootaxa 2655: 25–51. There are 4 registered keepers, view all "my cats" data. There are 2 records of this fish being seen, view them all.